Often facts and figures dealing with real estate markets are presented with numbers that lack any comparative context, and therefore provide only a limited snapshot of a particular housing market. 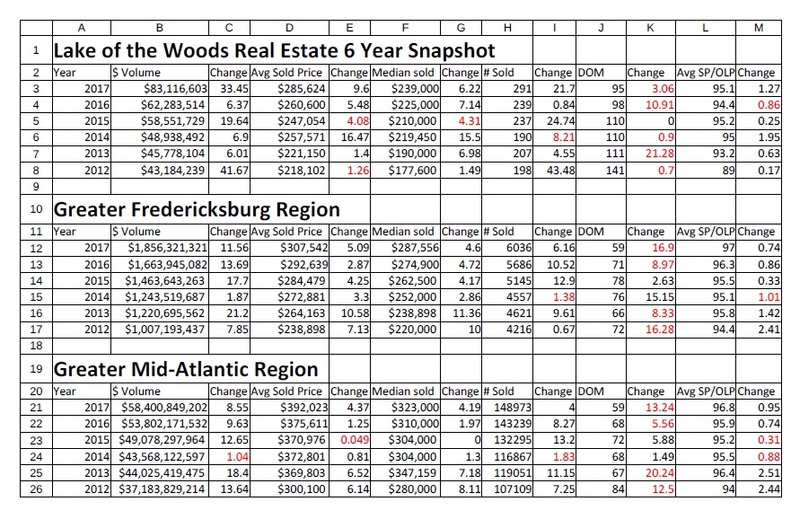 The following information is presented so that any interested homeowner in Lake of the Woods, in Locust Grove, Virginia can have a better perspective of the last six years of real estate statistics* at Lake of the Woods in comparison to the greater Fredericksburg area, as well as the Mid-Atlantic region. The first chart provided shows some key real estate categories, including Dollar Volume Sold, Average and Median Sold Price, Total Number of Properties Sold, Days on the Market (DOM) and the percentage relationship of Original List Price (OLP) to Sold Price. The change columns represent the percentage change from the previous year, with red numbers indicating a decrease (which in a couple of categories is a good thing). The real estate market in Lake of the Woods in 2017 was very robust, to say the least. Overall, the data for Lake of the Woods in 2017 shows a dollar volume increase 33% from 2016, with an increase of nearly 22% of homes sold, with 291 closed sales compared to 239 the previous year. These increases greatly surpassed the numbers for both the Greater Fredericksburg Area (11% and 6.2%), as well the Mid-Atlantic Region (approximately 9% and 4%) in $ value and number of homes sold respectively. Both the average (9.6%) and median (4.6%) sold price for homes in Lake of the Woods increased as well. These two categories also exceeded the numbers in the both the greater Fredericksburg area and Mid-Atlantic Region. Clearly the amount of new construction in LOW helped elevate these two statistics. Although the average days on the market (DOM) in Lake of the Woods decreased in LOW from 98-95 days from 2016-2017, it lags considerably behind this both the Fredericksburg and Mid-Atlantic Regions by over 30 days. In comparing specific data for LOW Additionally, although the average DOM is pushing 100 days, in 2017 over half of the LOW homes sold in less than 60 days which is more similar to the greater regional average. The eclectic nature of homes and the price range in the LOW community ensures a greater disparity in days on the market than a subdivision of more similar properties. This speaks to the need to choose a local relator in representing you as a buyer or a seller, to ensure you have a market expert to represent you. 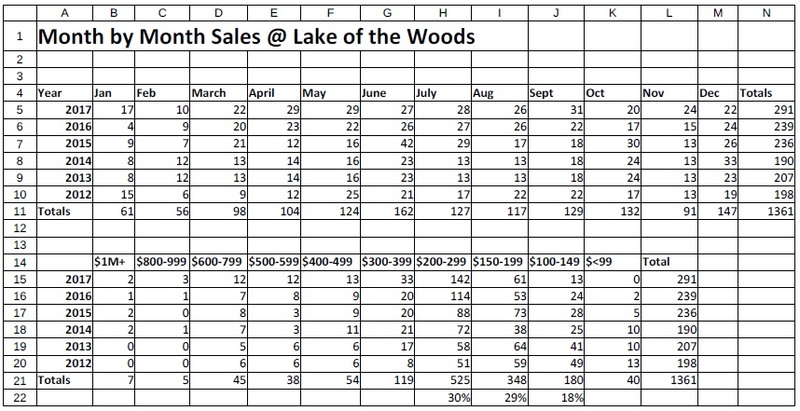 The Second Chart shows the number of homes that closed at Lake of the Woods, each month over the past six years, as well as the number of sold properties in different price categories during these same periods. June is typically the busiest month for closings on home sales reflecting the busy spring market, and January and February generally have the fewest closings, as the contracts written in late November through January are reflected when the market literally cools a bit. However, in 2017, September was the busiest month for closings with 31-refelcting a robust sales market over the summer and January was unusually busy for closings indicating a busier than normal late fall. That said, the real estate at Lake of the Woods stays pretty consistent throughout the year. Clearly, the number of homes sold in the various price ranges reflects that approximately 60% of the homes in Lake of the Woods, VA sell for between $150,000 and $299,000 reflecting the $239,000 median price, which is approximately $50,000 below the Fredericksburg region average. The average home sales average was helped greatly by an increase of higher-end homes ($400k and up ) which was up nearly 40% from 2016. 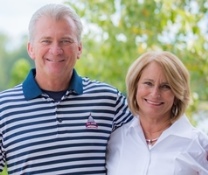 Given the amenities available at LOW, our community is a great deal for buyers. Generally, numbers of closed sales each month will reflect the market strength 30-45 days earlier. In summary, 2017 was an outstanding year for real estate in Lake of the Woods in Locust Grove, VA as continued recovery in the housing market continues. With more new construction underway, improving employment numbers and expanded opportunities for tele-commuting or alternate commuting options, continued low interest rates and general economic strength there is reason to be optimistic for a great 2018! However, with many looming national and international issues that have potential economic impact, hopefully 2018 will avoid any major economic disruptors. Look for our upcoming posts from The Ostlund Team on trends and developments impacting the local real estate market in 2018!